Compact yet powerful, the flexible PRO 918 has proven it's versatility in a wide variety of environments and applications in all professional lighting markets. • 575 Watt discharge lamp. • PAN/TILT range of 180°/72°. • 1 Rotating Gobo Wheel with 6 gobos plus open. • 1 fixed Gobo Wheel with 9 gobos plus open. • 2 color Wheels each with 9 color slots plus open. • Motorized iris and focus. 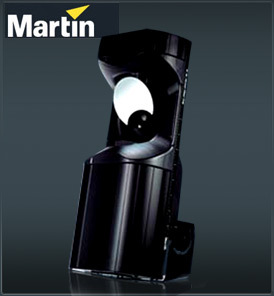 The Martin RoboScan Pro 918 is an automated moving mirror profile spotlight designed for a 575 watt discharge source. It provides 18 dichroic color filters, nine static and five indexed-rotation gobos, variable iris and focus, rotating three-facet prism, continuous full-range dimming, strobe effects up to 23 Hz, and 16-bit resolution pan and tilt. The luminaire shall be an automated moving-mirror profile spotlight employing a 575 watt light source. The luminaire shall be the Martin RoboScan Pro 918. The luminaire shall have two color wheels, each with nine positions for dichroic glass color filters and an open position. The filters on one of the wheels shall be replaceable. The wheels shall overlap to provide 100 possible full-color combinations. The wheels shall rotate continuously clockwise and counterclockwise and shall be positionable between filters. The luminaire shall have one wheel with nine static gobos and one wheel with five rotating positions for user-selectable glass or metal gobos. The rotating positions shall turn continuously clockwise and counterclockwise at variable speed, be indexible to 256 positions, and shall accommodate gobos 27.9 mm (1.098 in.) in diameter. The gobo wheels shall overlap to provide combined pattern effects, and the luminaire shall be capable of focusing either gobo image at a distance of 2 meters (6.5 ft.) to infinity. The luminaire shall have an iris that reduces the beam width 85 percent, and it shall have a three-facet prism that rotates clockwise and counterclockwise at variable speed. The luminaire shall be prepared for an optional frost filter that may be installed in lieu of the prism. The luminaire shall have a mechanical dimmer system to vary the intensity of the light output from 0 to 100 percent in 256 steps. The dimmer shall be capable of generating stroboscopic effects at speeds up to 23 flashes per second. The mirror shall pan through a range of 180° and tilt through a range of 72°. The luminaire shall respond to command signals conforming to either the USITT DMX512 (1990) standard or the Martin RS485 standard. User-selected software settings shall be adjustable via an onboard control panel with LED display or via data cabling with a remote control unit. The luminaire shall have two locking 3-pole XLR connectors for serial data transfer. When fitted with a new MSR 575/2 discharge lamp and 17° optics, the luminaire shall emit a total luminous flux of 8550 lumens. The luminaire shall be constructed of steel and aluminum. The exterior finish shall be an electrostatically applied powder coating. Non-structural covers shall be constructed of molded plastic. The exterior color shall be black or white. The luminaire shall be capable of operation at any orientation to vertical. It shall have an adjustable bracket that permits the fixture to be hung vertically with the mirror up, vertically with the mirror down, or at any angle in between. The bracket shall support the luminaire when placed directly on a stable surface. The luminaire shall be installed in such manner as to provide a minimum clearance of 75 mm (3 in.) between the lamp-section exhaust vent and any surrounding object, to provide a minimum clearance of 0.5 meters (20 in.) between the luminaire and any combustible material, and to provide a minimum clearance of 1 meter (39 in.) between the moving mirror and any surface to be illuminated. The luminaire shall provide a dedicated eye hook for secondary attachment. (EU model) The luminaire shall operate on 50 Hz supplies at 200, 230, and 245 volts, and on 60 Hz supplies at 208 and 227 volts. It shall be fitted with a three-pin male IEC socket for connection to AC power. The luminaire shall conform with CE safety standards EN 60598-1 and EN 60598-2-17, and with CE electromagnetic compatibility standards EN 50 081-1 and EN 50 082-1. The luminaire shall be electrically grounded. (US model) The luminaire shall operate on 50 and 60 Hz supplies at 100, 120, and 230 volts, and on 50 Hz supplies at 245 volts. It shall be fitted with a 2 meter (6.5 ft.) length of three conductor 2.5 sq. mm (14 AWG) electrical cable for connection to AC power. The luminaire shall be cETL certified for compliance with CSA standard C22.2 No. 166 and ETL certified for compliance with ANSI/UL standard 1573. (Certification pending.) It shall conform with CE safety standards EN 60598-1 and EN 60598-2-17, and with CE electromagnetic compatibility standards EN 50 081-1 and EN 50 082-1. The luminaire shall be electrically grounded. The luminaire shall be located in a dry area in which the ambient temperature does not exceed 40° C (104° F).